I find people's approach the music one of the most fascinating things in life. I have always found that the songs that mean the most to me are either the memories they bring or the lyrics they have. For others, it is how great the guitar sounds in a particular bit. But for all of us, it is how the song makes us feel and the affect it has on us. 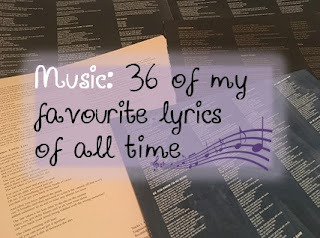 Since I first started getting into music, when I was around 12 or 13, lyrics have always been the thing that stands out for me the most and what stay with me for long after the song has finished. It all started when I went into Woolworths and I brought an album with my pocket money that still means the world to me years later: Whatever People Say I Am, That's What I'm Not by Arctic Monkeys. I suddenly swapped listening to Ciara and Ashanti and became obsessed with these nitty gritty lyrics that just spoke to me, because they were so real. Since then, I have found myself having to write down lyrics I hear in shops and bars to Google later on, I have stopped in the street when I have had to rewind a song on my Spotify to make sure that I heard a lyric correctly and I have laughed and cried to a lyric even when I know I'm about to hear it. I will listen to a song and wonder what inspired the artist to write that particular lyric. So I have decided to share with you just some of my absolute favourites - its a miracle I've got this list down to 36 - the original was 87. I was hanging out with Louie in the shooting gallery, when the news got through to me about you and Jeremy. Pat on my back, and a swig on my brew, you're still my friend, it's impossible to hate you. I said pretend you've got no money, she just laughed and said oh you're so funny. I said yeah? Well I can't see anyone else smiling in here. The autumn winds blow chilly and cold. She said, do me a favour and stop flattering yourself! But how many corners do I have to turn? All the love I have is in my mind? With someone you don't love?